← September: So much to do…. how about some leaves and berries? 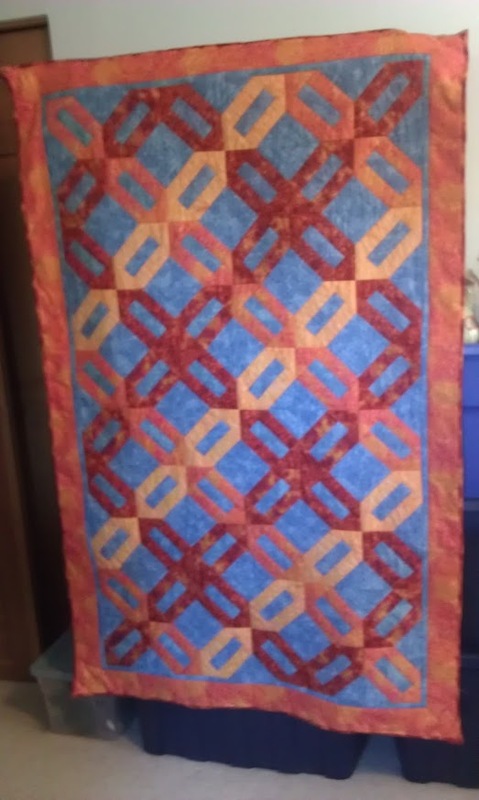 So awhile back my local quilt shop closed, and it was such a sad day for me. The owner, Mary, was one of those generous and kind founts of knowledge who seemed to be excited about your project and offered truly helpful tips and ideas to complete it. So I went to visit her during her closing sale and lament her loss and wish her well. And while I was there I did purchase a couple things, including a fine selection of orange fabrics, because I have a friend and I just knew she liked Orange. That was July 16th. Selected fabrics. The blue was bought separately. And my favorite out of them all was the orange with gold swirls… that’s the one I picked out first. Now I did ask her what her husband’s favorite color was, and was told that it was blue, so that would work out well for me.. a nice complimentary color even if I didn’t go the same shade as his absolute favorite. And so a few days later, while we were out seeing The Dark Knight Rises in IMAX on the week it opened (July 21st to be exact) the conversation came up again… and she says to us “Orange isn’t really my favorite color” O.O!!! 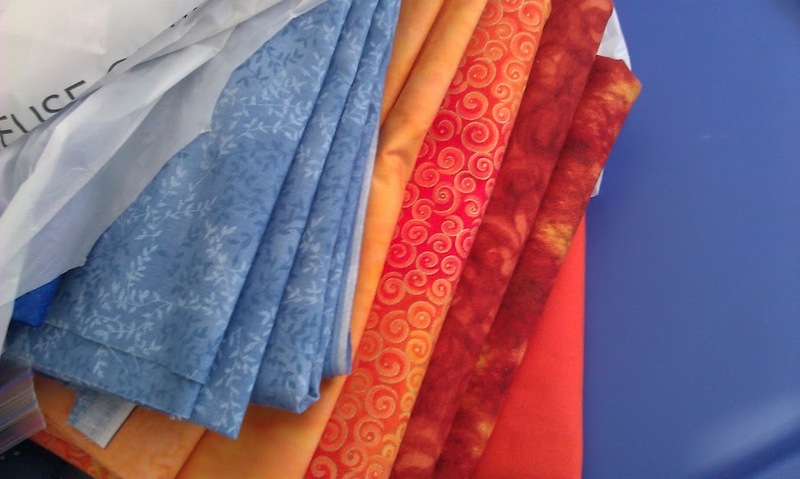 But since she has misled me all this time and she does actually like orange and somewhat collect things with orange, and because I’d already bought the fabric… she’s getting an orange quilt! And just to give her a bit of a giggle…. I immortalized that very quote on her quilt tag! Cracker Blocks arranged in a 4 color woven pattern. 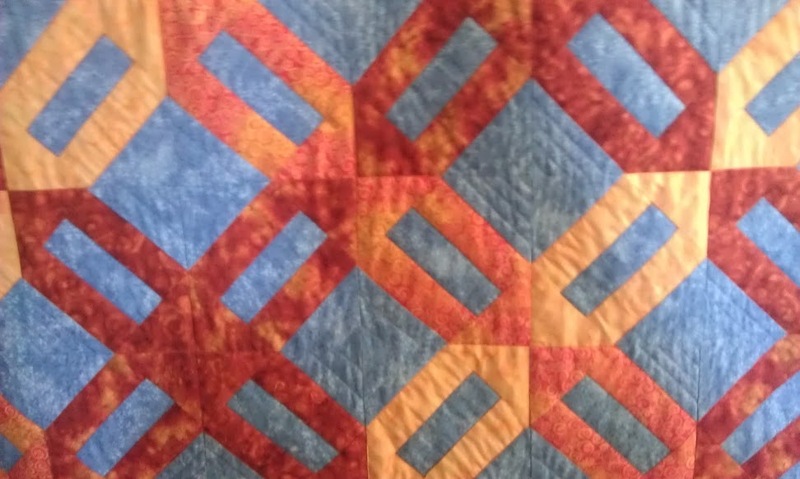 The design is called a cracker quilt. I found several people that think that this is the eating cracker related, but from what I’ve read and the design elements I believe its more a Gift Cracker related. Where the cracker design you see is a combination of the two long colored bars capped by their matching triangles in the first square and continues into the same colored triangles of the next square forming the gift cracker shape. I learned many new things while making this one… things like when you are making points, you should stitch your seam just behind the prior stitches and not through those stitches to get the best results. And my two dark oranges… don’t photo and look so disparate as I thought they would. For those of you that like such things… here’s a link to the gallery of in progress photos.